The “Top 25 Most Played” playlist in my iTunes library has The Pineapple Thief’s 2010 song “Preparation for Meltdown,” from Someone Here is Missing, positioned at #9. And with over 30,000 songs in the library, that’s a pretty lofty position, and speaks volumes to how much I enjoy going back to that album. It also explains why, through 2014’s Magnolia and 2016’s Your Wilderness, I kept hoping for more from Bruce Soord and his bandmates – especially with the addition of drumming legend Gavin Harrison prior to the latter. But the band seemed fixated on their moodier art-rock pieces rather than the gripping prog I first fell in love with. Which brings us to Dissolution, the twelfth album in the band’s catalog. The previous two albums have tempered my expectations to a degree, which is a good thing, because The Pineapple Thief pick up right where they left off two years ago, with moody art-rock that at times plays with progressive undertones. Dissolution is about the breakdown of a relationship in today’s age, where it all plays out on social media and everyone knows everything. For the most part, the songs feature bleak and depressing lyrics. It is clear throughout that this is a very cathartic experience for Soord, but it almost feels like an invasion of his privacy to listen to some of these songs (maybe that’s the point, though?). The album opens with “Not Naming Any Names,” a short, morose piano-vocal duet. “Far from our citadels/We know we can get you where you are” are the opening lines, setting the tone for things to come. “Try as I Might” carries on with the theme lyrically, although the song has a more ominous, threatening nature to it. The songs pair up to give us a very somber opening to the album. The Pineapple Thief do still know their prog, and not just in the form of outstanding drumming from Harrison. “Threatening War” starts out quietly, with delicately-picked acoustic guitar and rim shots on the snare, but it builds up into an intricate number that is one of Dissolution’s stronger songs. Other progressive gems include “All That You’ve Got,” which has an infectious groove and ‘8’s synth patches, and an arrangement that harkens back to Someone Here is Missing, “Shed a Light,” with a stellar light/dark arrangement, and album lodestone “White Mist,” an eleven-minute standout that features guitars from David Torn. The rest of the album is moody, pensive, and honestly depressing. Musically lush, it’s the lyrics that bring us down, with Soord issuing them forth in his Thom Yorke/Matt Bellamy voice. “You fight like you’ve given in,” he sings in “Uncovering Your Tracks,” and the chorus for “All That You’ve Got” states “Only if you knew what you put us through/Why did you put us through all that you’ve got?” All told, it’s very sobering material. 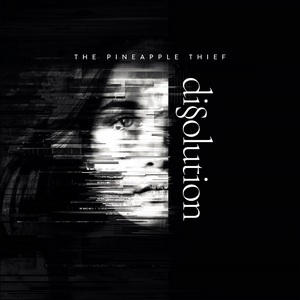 How much we all will enjoy Dissolution might depend on our state of mind, and our willingness to accept the evolution of The Pineapple Thief from quality prog to lush art-rock. With quiet, sobering, and personal lyrics, anyone who can relate to Soord’s experience will find solace in Dissolution. Others might have to look elsewhere.